Villagers living along the Salween River claim that the Thai energy authority are moving ahead with plans to build a dam at the Hat Gyi site. 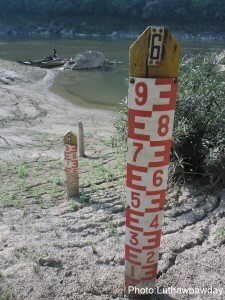 Villagers in the area said that the Electricity Generating Authority of Thailand (EGAT) have put up water level measurement posts on the Salween River bank at the proposed dam site. Local sources alleged that despite mass protests against dam projects proposed for the Salween River there are signs that work for the construction of a hydropower dam in the Hat Gyi valley, near HteeThadawHta village in Papun Township of Karen State, is starting. Speaking to Karen News, a villager (who asked not to be named) said. Villagers claim that EGAT officials made a guarantee that they would keep local communities informed about the proposed dam and would compensate them for losses caused by the dam construction. Villagers said that EGAT also explained that if necessary, residents in villages near the Hat Gyi area would be relocated to Pegu [Pago] Division. A local Karen National Union official told Karen News that after EGAT came in and marked the measurement posts, KNU officials from Papun (Mu Traw) district went to villages in Hat Gyi area and explained the possible impacts of the dam. If the Hat Gyi dam is built, nine villages in the Hat Gyi – HteeThadawHta, Patel Htar, PayarKhaung, BiluKyawe, YarmaHtar, KalawtelHtar, Mel Lar, Mel Payaydo, Mel payasay, and KyaukTalone will be flooded. The KNU official who took part in the impact awareness raising said. Currently, Burma Army soldiers and its militia, the Border Guard Force (BGF) Battalion 1014th, are operating in the nearby Hat Gyi dam project area. An environmental advocacy group, the Burma Rivers Network (BRN) on its website, claim that the Ministry of Electric Power in Burma, Thailand’s EGAT and the Sinohydro Company from China signed an agreement in 2006 to build the Hat Gyi dam on the Salween River in Karen State. BRN sources claim that it is estimated that the expenditure for construction of the Hat Gyi dam will cost USD $1 billion and will have a capacity of 1,200 megawatts – most of the electricity produced will be sold to Thailand.